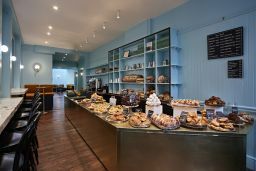 Bread Ahead’s latest bakery and café in Soho is now open. Founder Matthew Jones’s passion for baking is once again at the fore of the new project, with quality baked goods at its heart. Bread Ahead’s signature sourdough loaves are available, as are other firm favourites including the amaretti, Kouign Amann and, of course, their much loved doughnuts, alongside Bread Ahead’s other classic bakes. Bread Ahead Beak Street operates as a sit down café seating up to 60 people, serving hot breakfast, a new menu of savoury dishes for lunch and hot and cold drinks from 7am through to 7pm (10am on Sundays). The breakfast offering at Bread Ahead includes a variety of savoury and sweet dishes, including more indulgent options such as Croque Monsieur and Brioche French toast with bacon and syrup, and healthier options such as a ‘Build your own’ porridge bar and Gluten free waffles with almond milk yoghurt, berries and compote.